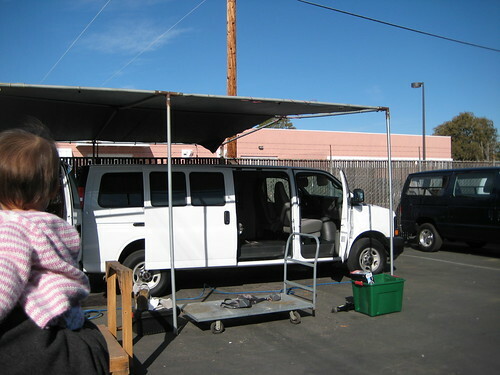 Mali Mish – Our Tow Vehicle: The GMC Savana Diesel Van. Our Tow Vehicle: The GMC Savana Diesel Van. 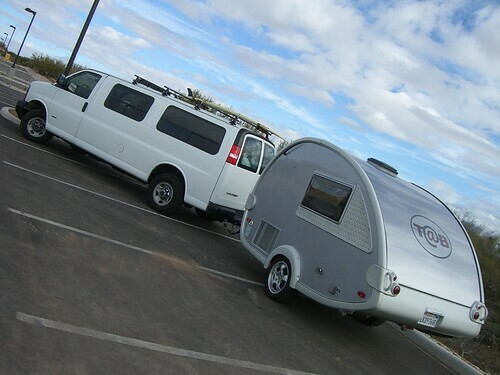 Towing an Airstream is not a simple task. It can weigh literally tons and the tow vehicle is the difference between a dream and a nightmare while you are on the road. For years I have always wanted a camper van. Having been a surfer for most of my life, I dreamed about road trips in my van with my buddies, packed full of camping gear and surfboards, exploring the coast of Baja Mexico for years on end. Well, Baja Mexico is no longer the paradise it once was thanks to Mexican drug lords, but I finally got the van of my dreams. 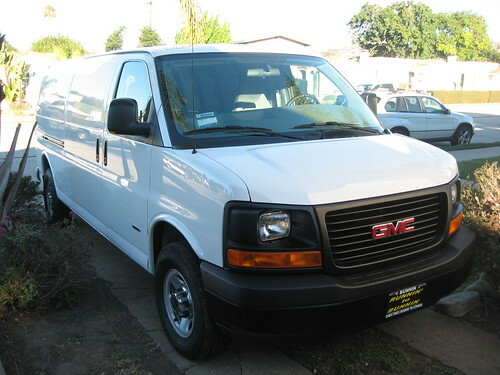 I decided on a GMC Savana 3/4 ton Extended van partially because I had $3000 worth of rebates through my credit card. 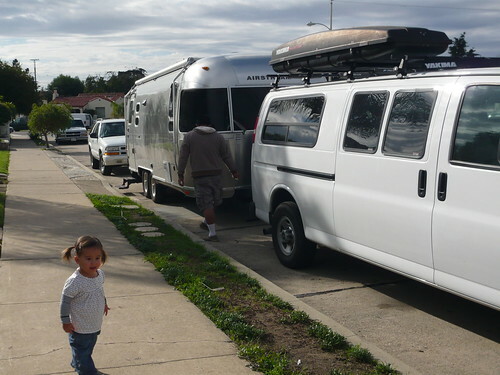 When we were van shopping, we did not know that we would one day be towing our Airstream. You ever asked yourself should you start a tow truck business? We did not either. 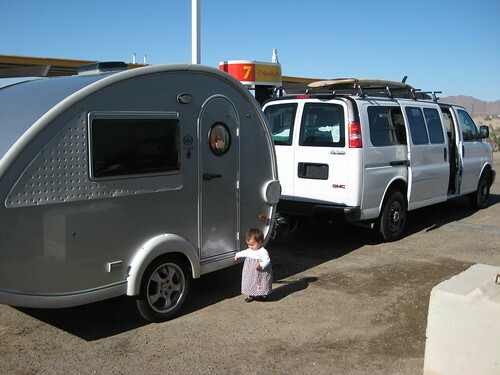 The van was just going to be the tow vehicle for our little T@B trailer we owned at the time. The T@B being a small camper, we were glad to have the extra interior space for storage and traveling comfort. It was a complete overkill of a tow vehicle for the T@B trailer as thus, most of the time we would actually forget we are towing the little teardrop. But we sure were glad to not have to upgrade when the time came to move up to the Airstream. 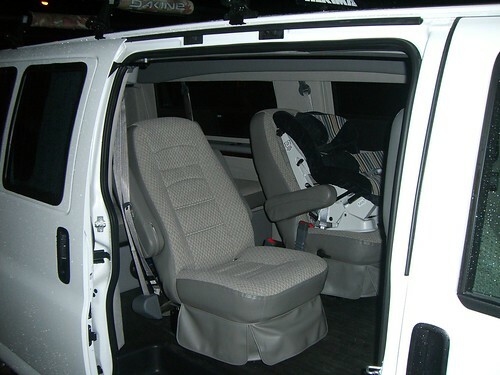 The van originally came as a cargo configuration with only the 2 front seats. The reason I had to go the cargo route is because I wanted the Duramax diesel engine. Passenger models do not have the Duramax option at all so this was the only route. 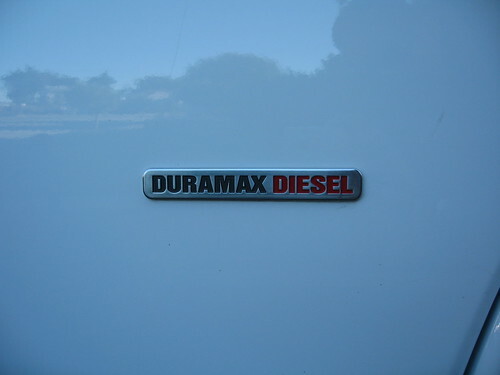 The Duramax diesel engine gives you a number of upgrades besides just the bigger engine. To support the platform, a larger alternator and dual batteries are required and has become a great way for us to recharge the batteries of the Airstream while we are towing. 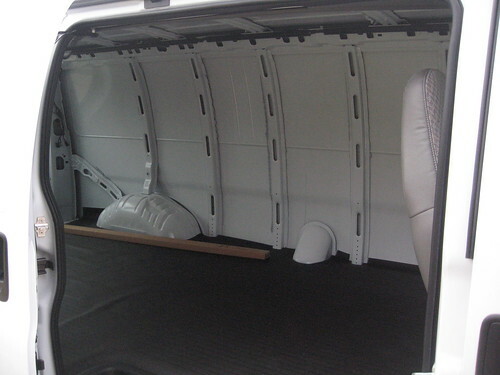 The cargo version is completely bare from just behind the front seats. When I say bare, I mean not even a headliner. 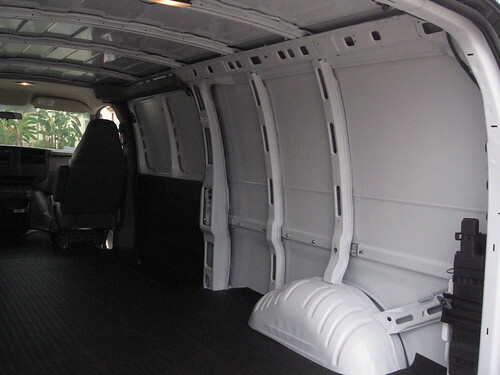 You see the bare ribs and sheet metal of the van’s interior structure. 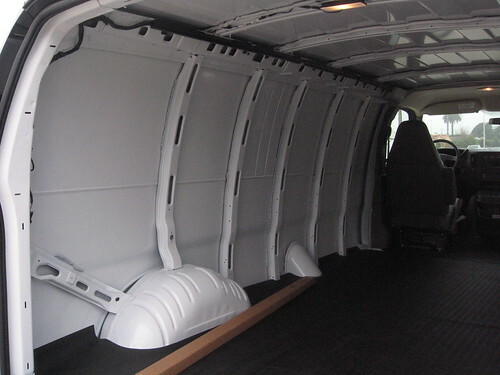 The only covering of any kind is the padded vinyl floor which we decided to keep because it is easy to maintain. Here are a few photos of the interior before the conversion. 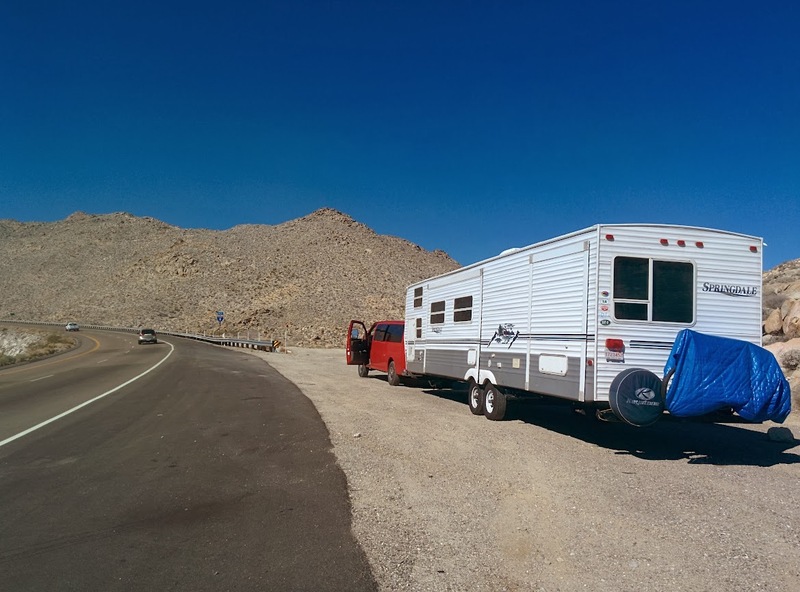 Before the van conversion was done, I took a trip to Arizona to pick up the T@B trailer that we bought second hand from a retired couple. As you can tell from the photo above, the van nearly shields the trailer completely as to produce no significant additional drag while on the road. In order for us to starting taking her on the road, I did some research on local companies who would do the conversion work. I decided on El Kapitan Vans from Westminster, CA. Bob Land who is the owner of the company was a pleasure to deal with and he made the experience very pleasant for us. We wanted to make sure we got the job done before they went on Christmas break as this was during the end of 2007. He squeezed us in and we got to come pick her up the very last day his shop was open for 2007. Here are some photos of the van on the day of the pick up. Bob and his crew putting the final touches on the van. 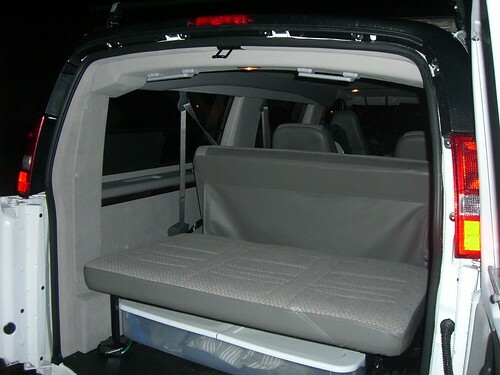 The third row folds down flat and with the bed extension creates a 6 foot queen-size bed that give us the option to lounge while we hangout in the parking lot. Check out Ava getting comfortable on the fold down bed. She was only about 10 months old then. The middle captain chairs are the best seats in the house. Bob and his crew installed 5 windows into the van. In these 2 seats, you have an expansive panoramic view of all the great places we have been, and will be, traveling to. 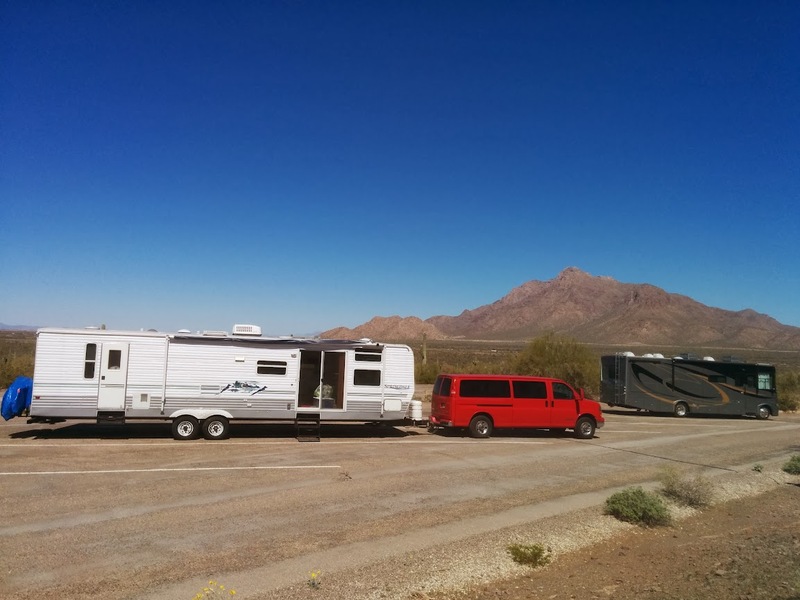 Shortly after picking up the van, we headed back out to Arizona on our first extended trip. Here are a few photos of the old T@B and the new van on various stops during the trip. Since the T@B was so light (about 1600 lbs), it was easy to push it around by hand and no weight distribution or sway control was needed. Once we moved up to the Airstream, we had to make all those adjustments to the tow system. I have blogged about the Equalizer tow hitch we chose to use and it has been working great so far. A few more upgrades to the van were made to make the rig more travel friendly. 2 pairs of Yakima racks were install on the roof with a fairing to help with the aerodynamics of the tow profile. My brother who lives up the the SF Bay area had a used Yakima rooftop cargo box that we are happy to temporarily adopt to give us some external storage space to carry things like camping fuel and gas cans since we don’t have outdoor storage of any kind. 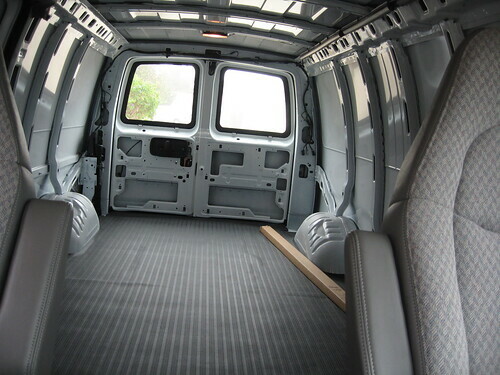 The cargo heritage of the van meant that many other areas beside the interior are very bare bones as well. For example, the dash display lacks a transmission temp gauge as well as a tachometer. The steering wheel does not tilt and there is no cruise control. I can live without most of them but I just had to get cruise control if we were going to put thousands of freeway miles on this vehicle. After some research, I found out that my van has an electronic throttle as standard equipment. It is something that GMC changed starting at my model year. It is easy to determine if you look at the throttle pedal on the floor and see that instead of a steel cable, it is just electrical wires connected to it. 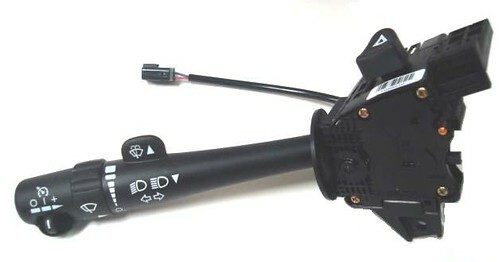 That made installing cruise control a simple task of just swapping out the wiper control arm on the steering column. I promptly ordered the part from thecruisecontrolstore.com and brought it with me to my first service appointment at the GMC dealership. One would reasonably expect the technicians at the dealership to have a pretty good knowledge base of what can and can not be done to a vehicle they work on day after day. But it was not the case here. The dealership insisted that the cruise control arm would not work as installed because the car is not set up to work this way. I reminded them that my van had the electronic throttle and they still insisted that a reprogram of the computer was needed to get it to function. It seemed to me that they did not want to do the work for some reason. Their way of avoiding the job was to quote me a $300 installation price. It was very discouraging. I set the new wiper arm aside for nearly a year before I decided to give installation another shot recently. It is suppose to be just a simple plug-in replacement. The only work involved is removing the plastic covering on the steering column. I had tried to remove the plastic myself but it got a little tricky and I felt like I was going to break the various hidden snaps it uses to hold it in place. I took it to a local stereo shop and they were willing to give it a shot. They did not know if it will work as promised either but at least they were willing to give it a shot. They even were willing to cut me a break on the labor if the swap turned out to not work so gave them the green light. A hour later, I drove off of their parking lot, got up to speed and pressed the cruise button. The Cruise Control light on the dash that was always there magically appeared and the car sped along on its own with my foot off of the pedal! Since then I have put probably about 2000 miles on the van and most of them have been under cruise control. It works beautifully. Just as if it had it all along off of the dealer’s lot. Ironically, the people who built the car were the last ones who thought it might work. The other complaints I have about the van is the ride quality. The rear seats are directly in front of the rear axle and it is really bouncy. I have seen people bounce and touch their heads to the ceiling in my rear view mirror. Apparently these vans are designed this way so it can handle heavy loads in the cargo area. Not so for the passenger versions. They apparently have a much better ride but have less towing capacity. In an attempt to fix the bouncy passenger compartment, I purchased Air Lift air bags for the rear suspension. After having it installed, the ride quality is only marginally better if the bags are filled to its rated capacity. 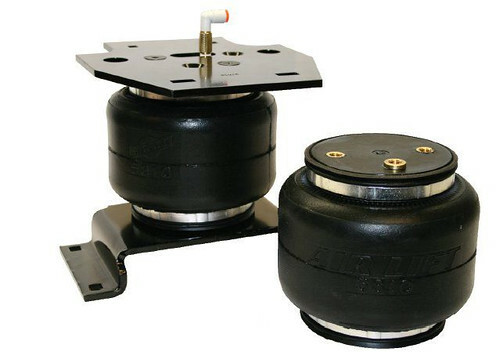 With the rated capacity of 50 psi, it also raises the rear suspension by a good 2 inches when the trailer weight is off of the tongue. That is not a good look to cruise down the street. You also feel like you are going to slip off of the seat because the rear of the car is up so high. With the trailer attached on the other hand, the air bags really do shine in leveling out the rig and giving it the suspension support it needs. I think the next upgrade is going have to be some premium gas shocks to eliminate the bounce. Many Airstreamers opt for the diesel platform and it is a great engine for gas economy and power. With our GMC Savana, we get around 14 MPG while towing and close to 20 MPG on the freeway when solo. It has a towing capacity of up to almost 10,000 lbs which gives us more than 3,000 lbs of head room. It makes climbing hills and passing slower big rigs on the road a breeze. We have been very happy with our choice of the tow vehicle and would recommend it to anyone looking for a combination of passenger capacity and towing prowess. Our interview in Wand’rly Magazine. Day 110: Two ships passing during the day in Columbia. Quenching Our Thirst for Power. 11 Responses to Our Tow Vehicle: The GMC Savana Diesel Van. I read your article about the Savana. I’m at that awkward age: ready to retire, but not ready for retirement. I’m looking for a tow vehicle for my 31′ trailer; there’s a 2004 1-ton Savana cargo van here in the Mpls area, with 160K. I don’t know what rear end. So thanks for the info about yours. Glad you like it. Can you tell me where the 2nd battery is? is it in the engine bay or on the fram rail. a pic would be great too, if you have the time for that. Douglas, it is on the outside of the frame rail. About the half way down on the driver side. This is a very nice setup and I’m eventually looking to have a similar vehicle to tow our huge TT. How much did the conversion cost you? Have you improved the rear suspension yet? I suspect you’ll need more than new shocks. You’ll need softer springs as well. It should work well with the airbags, though. You are right, it needs more than shocks and airbags. Softer springs is probably the answer but I don’t really want to compromise the load carrying ability. I am actually on my second set of airbags as the first set failed. It was nice to still have the stiff springs as we were still able tow without any problems. So far it has not been a problem as we do not use the last row for seating much. Your problem is one that has nagged me for a long time, as with any vehicle larger than a minivan manufacturers seem to be more concerned with load capacity and what numbers they can claim in the commercials than how comfortable the vehicle rides (or doesn’t) when mostly empty. As I’ve studied the issue, it is obvious the only way to achieve both of these goals is with some sort of adaptive or adjustable suspension. A spring needs to be stiff to handle a load, and soft to ride well without a load. Quality shocks can help, but they can only do so much, as they only control the speed that the spring compresses or rebounds, while the spring rate determines whether it actually compresses, and by how much. So if you set your spring rate and shocks to handle the load, you get the stiff empty ride you have, until you load it up with the trailer and things smooth out. If you use a softer spring, it will ride better empty and then sag when you load it up with the trailer. GM is happy to give you the ultimate system in their new SUVs if you want to pay for it–they use comfortable spring rates for the empty ride and then have auto-load leveling with airbags so when you load it up the airbags add to the springs to keep the ride level. Then they also have automatically adjusting shocks so they can adapt to the road conditions. Side note… the good news is I think the market is finally moving in that direction–the new Ram trucks offer such systems from the factory for the first time for any full-size trucks. Hopefully other manufacturers will see the value and follow their lead. 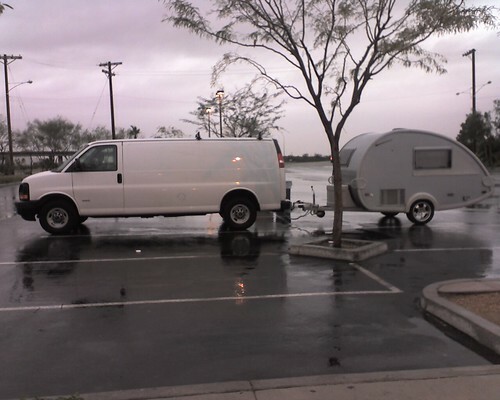 We tow a 11,000 lbs 39′ travel trailer behind our 2006 GMC Savana 3500 6.0L gas. We get 9.3mpg while towing on a level highway and can comfortably go around 62-65mph. It’s only in the mountains, such as east of San Diego on I-8, where our van would only be capable of going 30-33 mph uphill, while overheating very much (with interior fans on max heat of course). I wonder whether the Duramax engine is considerably better going uphill? I wish my van was a diesel but they did not make them in passenger configurations until 2012! Great article! What is the gear ratio on your rear axle? Is it the 3.73 or 4.10.